Let’s talk about smoothies, baby. “All smoothies are healthy, aren’t they?” If only this were true! Imagine: a world of ice cream sundae smoothies followed by a cheeseburger puréed delight and liquid chips. Just because it’s blended into a liquefied dream, it doesn’t mean it’s healthy. If you add the right ingredients, you can kick your day right where it needs it! And, no, you don’t need to be a wheatgrass-shootin’, yoga-practicing, California-living health nut to enjoy a smoothie. Smoothies have become a staple for everyone from professional hockey players to powerlifters to moms-on-the-go. 1. For the java-loving: try the Rise and Shine Skinny Coffee Smoothie. It has five – you counted right – five ingredients: bananas, ice, coffee, coconut milk, and coconut flakes. And as a bonus, it’s vegan, dairy- and gluten-free! 2. For the green thumbs: try and make your own custom green smoothie. Mix and match a green like spinach, kale, broccoli or lettuce with a couple of fruits, like berries and grapes with either water, plain yogurt, soy/coconut/rice milk. And voila: you’ve already consumed four servings of veggies and fruits by 9AM. Look at you go! 3. For the hungry bears: try Make-Ahead Oatmeal Smoothies. Mix chia seeds (a key superfood! ), oats, water or milk of your choice, fruit or sugar-free jams, nut butter (if you please), and any spices you wish. Your tummy will not grumble in your 10AM economics class, guaranteed. 4. For the pink lady: this pink breakfast smoothie may look delicate but it’s packed with a punch. A delightful combination of oats, peanut butter, honey, milk, strawberries, banana, and ice cubes. Drink it with your pinkies up! 5. For the vegans-on-the-go: try this Vegan Vanilla Milkshake Smoothie. Yes – it looks like a milkshake, except it’s good for you…and high in protein! Mix soft tofu, banana, vanilla soy milk, and peanut butter. That’s it! 6. For the superfood superhero: this Superfood Smoothie will have your body dancing for joy. Combine kale, bananas, chia and hemp seeds with almond milk in a blender and call yourself Superman. 7. For the chocoholic: try the Chocolate Avocado Smoothie – there is no guilt involved! Avocado, cocoa powder, banana, and Greek yogurt…oh my! 8. For the protein monster: try the Iced Coffee Protein Smoothie. You need your morning caffeine and you want your muscles to grow, right? Add almond milk, coffee, banana and a couple of scoops of protein powder and blend it for those muscles. 9. For the sweet tooth: the Peanut Butter Cup Power Smoothie is perfection. Who knew that mixing spinach, bananas, peanut butter, cocoa powder, flax seed, and almond milk would taste so divine? 10. For the beach bums: try a tropical breakfast smoothie. Packed with warm-weather fruits like pineapple, mango, orange, and passionfruit – you can pretend you’re lying on a beach in the Tropic of Capricorn instead of your 10-year-old kitchen chair with the wobbly leg. 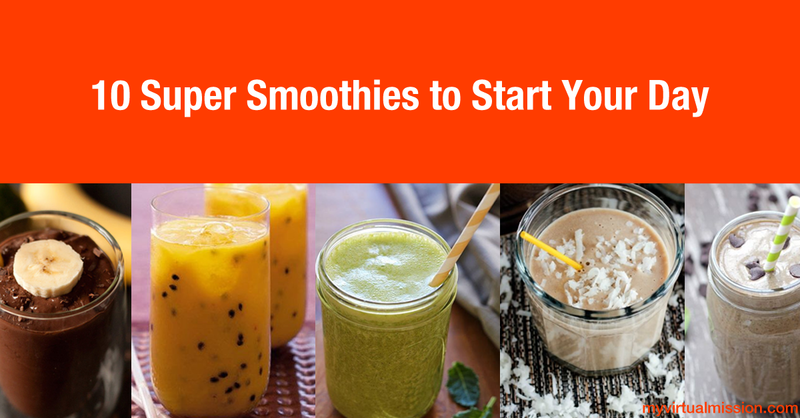 Do you have any special smoothie recipes to jumpstart your day? For more health and fitness tips and inspiration for your own mission, check out My Virtual Mission’s Pinterest, including our Sumptuous Smoothies board!